Colorful, evergreen shrubs and bushes that are popular in the south, azaleas (Rhododendron) offer early color in many sizes and shapes. These easy-to-care-for plants thrive in partial shade with moderate water, making them similar to their more cold-hardy cousins in the Ericaceae family, including rhododendron, mountain laurel and blueberries. Most plants in this family prefer acidic soil and are evergreen. This giant group of plants has about 800 species and more than 10,000 named varieties, according to the "1997 Sunset National Garden Book." 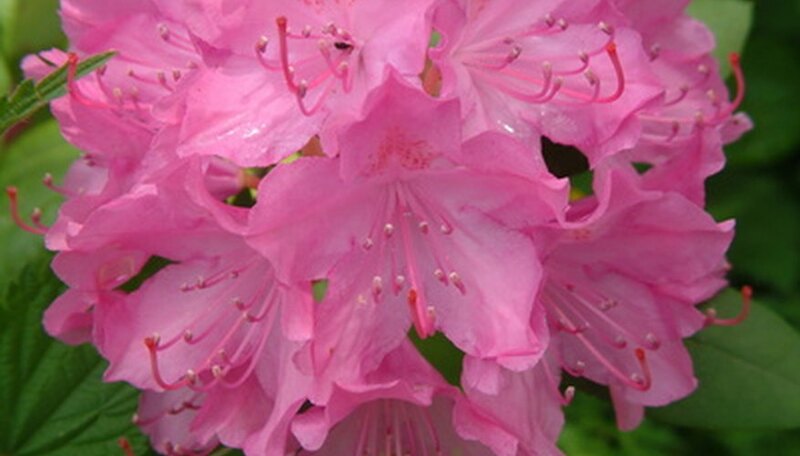 Rhododendron, which are hardy and often grown in Northern states, bloom in mid-spring through the summer. Varieties are available in a rainbow of colors, including white, magenta, red and lilac blue. Rhododendron require more air in the root zone and soil should be fast-draining but retain moisture. Rhododendrons thrive in shade. Ironclad hybrids, including 'President Lincoln,' can survive to -25 degrees F while 'Cheer' and 'Holden' are among the varieties that will tolerate hot summers. Mountain laurel (Kalmia latifolia) is a more elegant version of the azalea or rhododendron that has cup-shaped blooms with five star-like points around the rim. An evergreen shrub that thrives in full sun or partial shade, mountain laurel is native to the Eastern Seaboard of the U.S. Also known as calico bush, mountain laurel is a slow grower that can reach 8 feet with glossy, oval leaves. Mountain laurel blooms in late spring and has small pink blooms in clusters that are about 5 inches across. The 'Bay State' variety has coral-colored blooms, while 'Pinwheel' has bi-color blooms in red and white. Evergreen huckleberry (Vaccinium ovatum) is native to the Pacific coast and grows best in the shade. If planted in the shade, these shrubs can reach 10 feet, but will stop at about 3 feet in sunny areas. Huckleberry has leathery, dark green leaves and white or pink flowers that bloom in spring. The fruit, which is a black berry, is popular in baking and canning. Huckleberry plants are erect, making them good hedge plants, but they may also be grown in pots.